Hello, hello. And I am back this week yet again with my Waiting on Wednesday in which I talk about books, my favorite thing to do. And as you may know, I have a tad obsession with a little lady named Jennifer Brown and her writings. Summary: Ashleigh's boyfriend, Kaleb, is about to leave for college, and Ashleigh is worried that he'll forget about her while he's away. So at a legendary end-of-summer pool party, Ashleigh's friends suggest she text him a picture of herself -- sans swimsuit -- to take with him. Before she can talk herself out of it, Ashleigh strides off to the bathroom, snaps a photo in the full-length mirror, and hits "send." 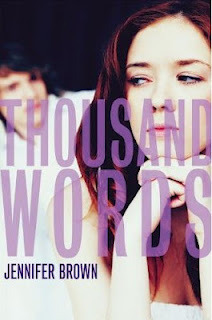 My Thoughts: Three words: Jennifer FREAKING Brown. That's all there's to say about it because she's freaking amazing. BUT, her name Ash-le-ig-h, her name has too many syllables. I don't like it. I really need to read something by this author. I hear nothing but good things! She's a really great writer. Yes. I love J. Brown and can't WAIT til this comes out!!!!! Me either. I'm dying with anticipation. Ahhh I'm actually wanting to read these books...they look so good and sad and heartbreaking and wonderful. Thanks for reminding me I need to pick up one of her books sooon! Yes, her books are so sad, but yet, so intense. They are epic. Mhm, I think I've seen this one before. I have not read a Jennifer Brown book yet, though, so this one would be my first. I always wanted to pick up Hate List, too - have you read that one? And if so, did you like it? Hate List was really, really, really good. It was her debut and the first book I read by her and I loved it. Bitter End was also by her, I liked it as well. I own Hate List but haven't gotten to read it yet. It is pretty high on my tbr pile though. Hate List was really spectacular.